Veganstore.com, operated by Pangea Vegan Products, is a site after my own heart. As a recently turned vegetarian (as of a year ago), I’m definitely in the target market. Too bad it’s unlikely I would have discovered the site. That’s because I’m not strictly vegan, and the site isn’t targeting “vegetarian” as a keyword. The only occurrence of “vegetarian” on the home page is in the meta keywords — and meta keywords don’t affect rankings (at least not positively!). Regardless, I doubt I’d come across the site in my searches — even if I were a vegan. The site doesn’t appear on page 1 in Google for the most popular vegan-related keywords (according to Google Suggest) like “vegan,” “vegan recipes,” “vegan diet,” “vegan shoes,” “veganism” and “vegan food.” It does rank No. 1 for “vegan products” and No. 3 for “vegan body care,” but those keywords just aren’t popular. The problem begins at their home page, where the only body copy (excluding link text) is the keyword-less sentence asking visitors to sign up for the email list. No H1 tag either. Perhaps as a way to compensate, the home page title tag has been keyword-stuffed — with five occurrences of the word “vegan.” Definitely over the top. In fact, this “spammy” title text is used repeatedly — at the end of every title tag across the site. 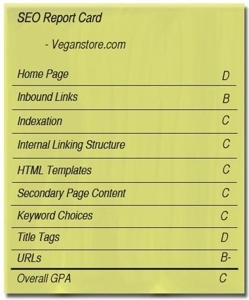 The left hand navigation is a list of categories — good that they are text links, bad that not a single one contains the word “vegan.” Anchor text is an SEO’s secret weapon. Turning the “Shoes” link into “Vegan Shoes” will go a long way towards improving their ranking for “vegan shoes.” No need to revise every link, only the ones that are highly searched on categories. I do like the “Best Seller” list of links on the home page. Too bad not a single one of those has the word “vegan” in the anchor text either. The “Featured Products” on the home page display the product names as text, but strangely they aren’t links. Instead it’s a graphical “Details” button that is the link. The Pangea logo, on the top left, leads to /index.html. Instead, it needs to point to / to avoid creating a duplicate home page for the spiders to index. Speaking of duplicate content, I found https:// pages being indexed in Google. Need those 301 redirects! From past columns you may recall that duplicate content can push pages into Google’s Supplemental Index. I employed a little-known trick for finding Supplemental Results (searching Google for “site:veganstore.com * -asdfasdf” and discovered 843 of Veganstore.com’s 1,540 pages are in “Supplemental hell.” Much more analysis is needed to uncover the reasons for the scale of this Supplemental problem, but it’s certainly not limited to https:// pages. Going into the “Shoes” category page, there is an H1 heading tag containing “Shoes.” But again this is a similar issue to the anchor text pointing to this page: the word “vegan” is noticeably absent. Also, the title tag begins with the word “Shoes” instead of “Vegan shoes.” Additionally, this page is particularly problematic, in comparison to other category pages, because there are only two links to go deeper into shoes: “Shoes by Style” and “Shoes by Brand.” There is no list of different styles, nor a list of brands (e.g. New Balance and Wanderlust). Add those brand names and styles to this page and make them text links. Veganstore.com has a category page called “Food Items.” Instead, it really should be called “Vegan Food” — and this newly chosen keyword focus should be reflected in the anchor text, title tag, and H1 tag. On this category page, there are a handful of sub-categories such as “Cookies and Baked Goods” — that sub-category page should be targeting search terms such as “vegan cookies” and “vegan donuts” but it does not. The URLs have been rewritten to remove question marks, ampersands, and equals signs. Some links slipped through the cracks and don’t use the rewritten URLs, such as the links in the breadcrumbs, thus leading to duplicate page indexation and PageRank dilution. Despite the URL rewriting, the URLs are still problematic. Some product-page URLs contain way too many hyphens. Spammers tend to stuff hyphens and keywords into URLs, so exercise restraint. I also found URLs that are too many directories deep. The PageRank score for the home page is a 6 (out of 10), which is not bad. There isn’t a steep drop-off in PageRank as one goes down the site tree, as I sometimes see with sites. I credit the spider-friendly URLs, at least in part, for that.